This Dutch brand for gifts and home accessories made in developing countries seeks to help both disadvantaged producers and customers that want to buy fair trade products. A folded vase? 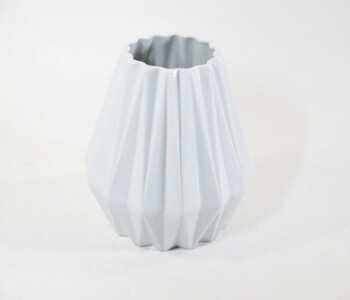 The FairForward Origami Vase 21 cm is inspired by origami folding techniques. This designer vase of white ceramic has sleek folding lines, as if it were made out of paper. Because of the tapered this fair trade vase is especially suited for a lovely small bouquet. A great addition to your home, especially in combination with its larger brother! 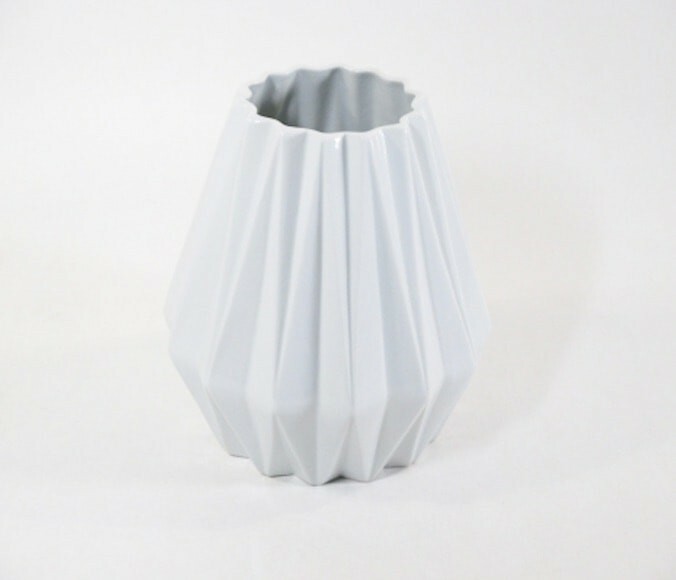 The FairForward Origami Vase 21 is a medium, white vase with a tapered neck. Characteristic of this fair trade designer vase are the sleek folding lines, as if the vase were made out of folded paper. In Thailand – where the Origami by FiarForward is produced, origami is indeed popular. The producers stick to their roots! This fair trade vase is a great addition to your home, especially in combination with its smaller brother. FairForward designs fair trade gifts and home accessories under the Fair Trade Original brand. The Origami Vase 21 cm by FairForward is manufactured in a fair way and the Thai producers can actually make a living from their work. We invest in a sustainable future! The FairForward Origami vases are striking and elegant at the same time. The sleek lines and folded shape allow your living room to shine. The Origami Vase 21 cm is a medium vase. It is 21 cm high and has a diameter of 17,5 cm. This designer vase is made of white ceramic and has a wide neck. The Fair Trade Original Origami Vase 21 cm is therefore especially suited for small flower arrangements. The vases are also available with a smaller neck, with a size of 23 cm high and a diameter of 10 cm. This ceramic designer vase is a true style icon. Let’s hope that the FairForward Origami Vase 21 cm has a long and happy life, just like the origami crane!